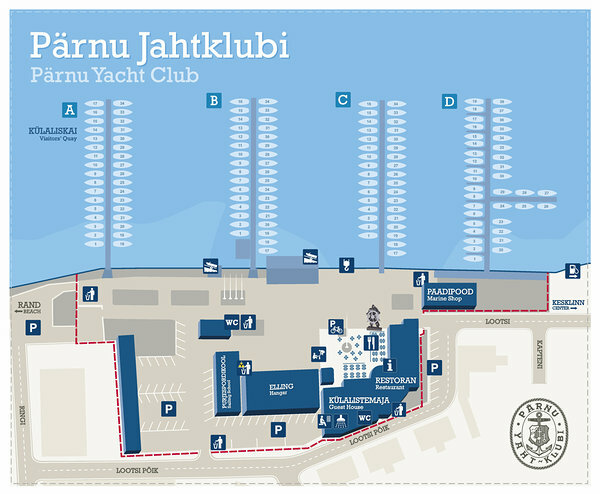 Pärnu Port is one of the biggest marinas in Estonia. There are 140 moorings at the marina, including 34 for visitors. The marina is suitable for vessels with length up to 16 meters and draught up to 3 meters. We have drinking water, power sockets in the quays, toilets, shower and sauna, accommodation and a restaurant. You can also refuel and have minor repairs done on your yachts. The Yacht Club also organises many world-class regattas and smaller races on Pärnu Bay. Several concerts, jazz nights and quizzes have become a tradition. In the yard you will find a play boat for children and the sculpture of the most legendary Estonian sailor, Kihnu Jõnn. The service includes: mooring, water, electricity, waste collection, shower. Crane services according to the service provider’s price list.